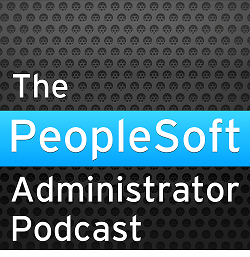 There's a bunch of issues with PeopleSoft running as Windows Services. * Every appserver and process scheduler in PSHOME is one service. You stop one, you stop them all. Not so great when your dev environment gets stuck on the same server as user acceptance testing. * The service runner .exe has no idea about what psadmin actually does. It just knows that it runs some process, but doesn't understand anything else about it. * The service runner .exe has very little knowledge of the Windows Services APIs. It can't tell that the domain(s) are still booting and properly tell Windows that things are starting up. Half the time it ends up proclaiming that the service couldn't start when the appservers are still booting. * If you set your webserver service to be dependent on the appserver service, Windows will not let you stop the appserver without stopping the web server as well. What the webserver needs is a little stub service that tests connectivity to the appserver. Then it can wait on that at startup time to make sure that there is an appserver available. That would also help in multi-machine configs, or when you have *nix appservers. * psadmin resolves %PS_MACH% differently on multi-homed machines when running under a service as compared to running interactively. It will bind to different IP addresses depending on how it was started. A customer of ours got bitten by this recently. We should be able to show some solutions for some of this at the Amsterdam conference in May. "Every appserver and process scheduler in PSHOME is one service" - which is yet another reason to have different development environments in different PS_HOMEs (The main reason being the ability to roll in PeopleTools patches gradually). "If you set your webserver service to be dependent on the appserver service" - I don't recommend that either.